When THE FAST AND THE FURIOUS first revved its engines in 2001, no one knew they were seeing a billion-dollar franchise at the starting line. The film was just an in-name-only remake of a 1995 drive-in movie. Co-star and family cornerstone Vin Diesel didn’t even bother with the second film! But the fourth movie, FAST & FURIOUS, kicked the series into overdrive. 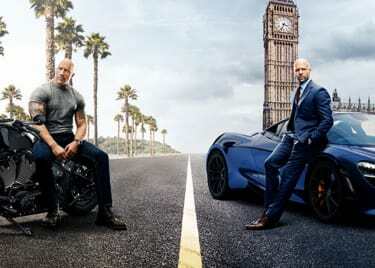 With the ninth installment and first spinoff, HOBBS & SHAW, coming this summer, we’ve been revisiting the entire series. So, what’s the best order in which to watch the FAST & FURIOUS movies? Fans know there are a couple of big wrinkles in the storyline. The movies, as released, are not exactly in chronological order. The chronological story order is by far the best way to revisit the series. This THE FAST AND THE FURIOUS viewing order isn’t exactly rocket science, but it does put events in their proper place — and it might have you looking at a couple of characters in a different light by the time the series is over. It begins here. We meet undercover LAPD detective Brian O’Conner, played by Paul Walker, who is tracking a gang believed to be responsible for a daring electronics theft. 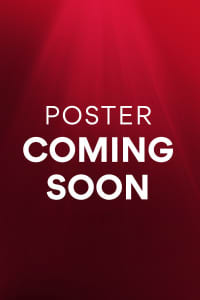 He soon comes across Dom (Vin Diesel); Dom’s sister, Mia (Jordana Brewster); and Letty (Michelle Rodriguez). Dom and his crew clash with a rival gang even as Brian falls for Mia and develops a cautious friendship with Dom — only to learn that his new friend is in fact the target of his investigation. Rather than making the arrest, Brian lets his new buddy go. Dom is seen driving off through the desert, while Brian has to deal with being a fugitive from justice. This awkwardly titled short film was a DVD extra. It isn’t essential viewing, but it does show Brian’s escape from Los Angeles and his flight across the country toward Miami. Since we’ll never see new footage of Brian, as Paul Walker was tragically killed in a car crash in 2013, this is a nice bonus. The tables have turned, and Brian is now an illegal street racer in Miami, Florida. He meets race promoter Tej (Ludacris) and falls into a trap laid by customs agent Monica (Eva Mendes). Pressed back into undercover work to take down a drug lord in exchange for having his record wiped clean, Brian recruits his old friend, Roman (Tyrese Gibson), to help with the plan. Vin Diesel wrote, directed and produced this short, which follows his character, Dom, as he plots a somewhat altruistic oil theft after escaping the U.S. and making a home in the Dominican Republic. Dom’s romance with Letty sparked anew in this short, and we see Sung Kang’s character, Han, in what acts as his introduction for this viewing order. Dom, Letty, Han and the rest of their crew are still hijacking oil in the Dominican Republic, but attention from the cops causes Dom to disband the gang. Months later, hearing that Letty has been killed, Dom begins to investigate her death. Much to his surprise, he runs across Brian, now an FBI agent, in Los Angeles. The two men realize they’re both after a drug lord who runs heroin across the U.S./Mexico border. This film introduces Gal Gadot as Gisele, who initially works on the wrong side of the law — the very wrong side — but changes her affiliations before too long. This is where things really start to come together. The last film ended with Brian resigning from the FBI and Dom on a bus bound for prison, and this picks up almost immediately with Brian and Mia breaking Dom out of custody. They all flee to Rio, where a criminal job throws Dom, Brian and crew up against the DEA. As Diplomatic Security Service agent Luke Hobbs (Dwayne Johnson) arrives to arrest Dom and Brian, the two men and their crew organize a heist to fund a new life — specifically for Brian and Mia and their unborn child. Many old characters are brought together for the job: Han, Gisele, Tej and Roman. Elena (Elsa Pataky), an officer helping Hobbs, falls for Dom and they begin a relationship. As their romance begins, Hobbs learns that Dom’s old love, Letty, is still alive. The crew has scattered around the world, with couples forming left and right. Dom and Elena are together; Brian and Mia have a young son, Jack; and Gisele and Han are living together, while Tej and Roman have their own party pad. Hobbs comes calling on Dom, asking his help to capture special ops soldier gone rogue Owen Shaw (Luke Evans). The FAST & FURIOUS family reunites, but they get a big surprise when they finally find Shaw: Letty is working with him, and she shoots Dom without a second thought, much less a hint of remorse. In the ultimate battle with Shaw, Gisele sacrifices herself to save Han. The amnesiac Letty reunites with Dom, despite not truly remembering their time together, and Han heads off to Tokyo. The best thing is to watch TOKYO DRIFT — the third film in the series — in this place, but save the final post-credits scene of FAST & FURIOUS 6 for afterward. Seen in this order, the movie, which seemed like a one-off only tangentially related to the rest of the series, has a lot more resonance. Han has made a life in Tokyo supplying cars and parts to the “Drift King,” Takashi (Brian Tee), who runs up against Sean (Lucas Black), a troubled American high school senior who has been sent to live in Japan with his military officer father. Han is killed during a street race partway through TOKYO DRIFT, and the post-credits scene from FAST & FURIOUS 6 reveals that his death was at the hands of Deckard Shaw (Jason Statham), brother to bad guy Owen Shaw. Now the drama really gets going! Dom, Letty, Brian, Mia, and their families and friends are trying to live peaceful lives, but Deckard Shaw wants revenge. He breaks into the office of Hobbs to get info on Dom and his crew. Our heroes, however, are giving an assist by Mr. Nobody (Kurt Russell), a government operative who promises to protect the family from Shaw if they rescue a piece of powerful tech called the God’s Eye and its creator, the skilled hacker Ramsey (Nathalie Emmanuel). With Hobbs and Mr. Nobody on the side of the good guys, Shaw is eventually captured and imprisoned, and Brian, Mia and their family drive off into the sunset to live quietly. It’s a fitting finale for the character played by Paul Walker, who died during production of the movie. Here’s where things get complicated. Dom is coerced into helping Cipher (Charlize Theron), an elite cyberterrorist who has been pulling the strings of several of his previous antagonists — including Owen Shaw. Dom goes rogue, seeming to help Cipher, and Hobbs ends up imprisoned in the same facility that holds Deckard Shaw. Soon, they both break out of the clink and a high-stakes operation begins, with Dom trying to work against Cipher from the inside even as she threatens his old flame, Elena, and the son Dom didn’t know he had. Deckard slowly switches sides to work with Dom and Hobbs — much to the dismay of some fans who are still more than a little angry that Deckard killed Han. How can he be part of the family? 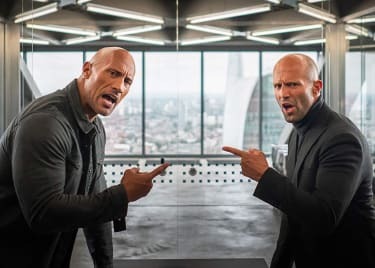 The answer may lie in the spinoff title, HOBBS & SHAW, which further explores the comedic and combative relationship between the franchise’s two most muscular men. FAST & FURIOUS PRESENTS: HOBBS & SHAW opens on August 2.